After taking the "red pill" and heading down the path of resiliency, growing your own food and becoming a gardener is a step many of us take and fall in love with. Some of us come from gardening and/or farming backgrounds and have years of experience with our hands in the soil. Some say its a labor of love. We experiment, learn, and grow. It is always challenging and rewarding. Here I share a recent discovery of a gardening technique that has given me a better understanding of natural growing and hopefully better results with less effort. I would like to introduce the Back to Eden gardening method. It’s hard to argue with the facts, and the fact is that the Back to Eden method of gardening is producing excellent results. Paul Gautschi’s film, Back to Eden, provides all the information needed to get started, and viewers will find it peppered with quotes and anecdotes from the Bible, which are delightful enough even to the unreligious. 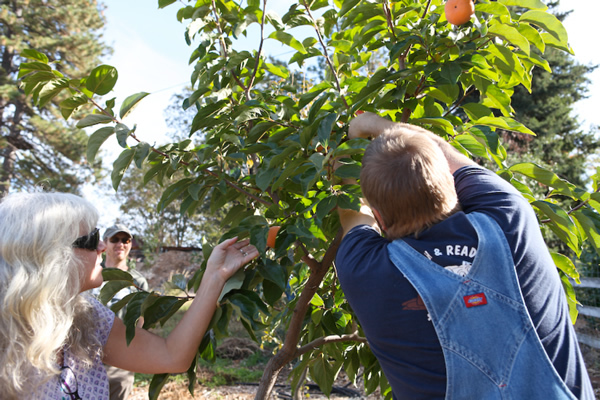 Between the Internet and word of mouth, Back to Eden farms are popping up all over the place. A group of Peak Prosperity members had the opportunity to visit one such farm nestled in the foothills of the Sierra Nevada in California’s Gold Country. The farm was only in its first year, and the results are nothing short of phenomenal. Having previously used organic raised-bed gardening, complete with all the usual agricultural problems of fertilization, crop rotation, pest control, watering, and weeding, the owners of this corner of Earth are complete converts. Our tour to this local Eden farm showed us some amazing results – produce from the garden and fruit from the orchard, dripping with water when it is harvested, full of nutrients and flavor, the way only nature can do the job. 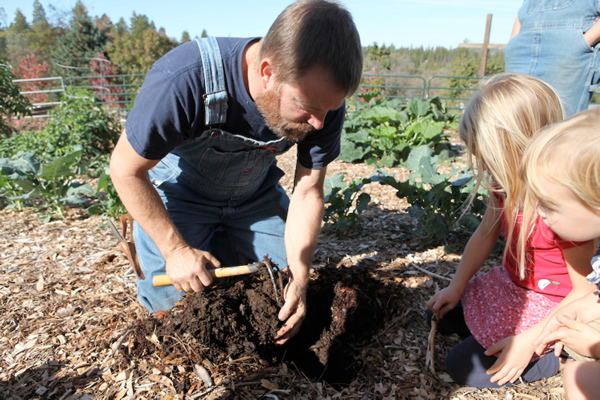 The soil was beautiful – rich and dark, perfectly moist, and full of life. And this was all done using a very simple, no-till gardening technique. Looking to nature for its inspiration, Paul Gautschi (the original developer of the Back to Eden approach) found that none of the usual agriculture problems existed in nature’s unaltered system. And what Paul found by studying nature was that it was all about the covering on the ground. The ground should never be exposed. Never. Paul recommends covering it with whatever organic material you have on hand – wood chips, straw, animal manure, even rocks if that is all that is available to you. His favorite covering? Wood chips. Preparation for your own Eden garden is simple. 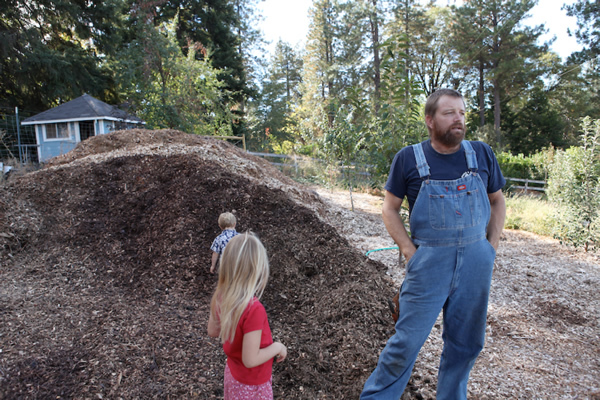 The first step is to find a source for wood chips. Chips can be had by anyone who lives in a place where there are trees. All that is necessary is to get in touch with local tree services and get on their list of places to dump their wood chips. Let the wood chips compost in a large pile for 6 months to a year, or immediately apply them “raw” in a 4-6” layer directly over your garden beds. If you are using chips that have composted in a pile, then you can plant immediately. Choose a garden space with good sunlight exposure and a relatively flat area. Many people have started right over a lawn; the film recommends placing a layer of newspaper or cardboard down first to help deter very tenacious weeds and grass from growing through, but in many cases you can have perfectly good results layering directly over the base. If weeds do pop through, simply remove them (which is particularly easy) before they go to seed. Cover with 4-6” of wood chips (resist the temptation to till! ), another 4” of manure or compost, and you’re ready to go. 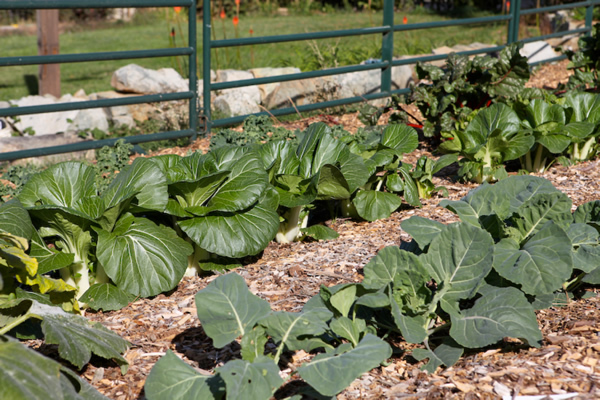 Ideally, if you are using fresh, uncomposted wood chips, then it is best to let this garden lasagna winter over to decompose a bit, with the fines from the chips settling down into the dirt layer and some of the organic nutrients from the chips leaching down as well. 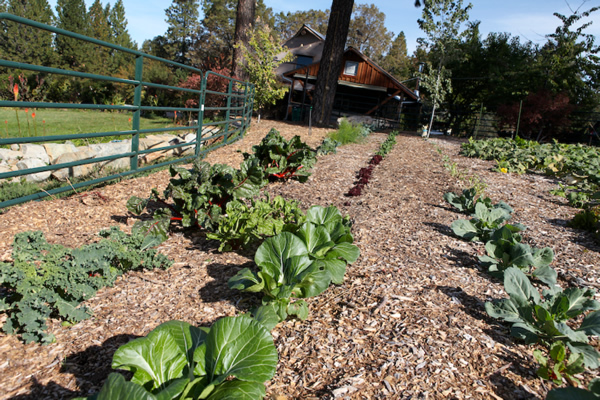 In the spring, the garden is ready to plant – simply make a furrow in the chips to expose the ground underneath, and transplant starts or direct seed into the dirt under the wood chips. Allow the seeds to sprout, and then gently replace the wood chips around the plants. The wood chips will slowly break down and help fertilize the soil underneath, they cut down drastically on the need for irrigation, and they suppress weeds. This system also develops a perfect pH with no muss or fuss, and via decomposition over time, creates a rich soil base that needs only an occasional application of manure/compost. Also a blessing to the gardener is that the wood chips are the perfect ecosystem, wicking water away when there is too much and retaining water for use by the plants when there is not enough. Although there is a lot of common sense and results behind Paul Gautschi’s gardening technique, probably the most important premise he espouses is “easy”! If gardening is hard work for you, you’re probably doing it wrong. Bottom line – it just makes sense, and who can complain about virtually no weeding or watering, even in the hottest climes? I invite you to give this method a try and experiment with using a Back to Eden wood chip garden. Share your thoughts, experiences, and ideas of how to use this method and look into getting some wood chips today.